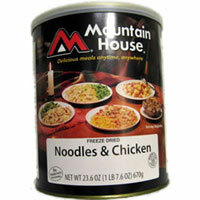 Mountain House #10 can of Rich, creamy sauce with asta and chicken ulli12.5 1 cup servingsLongest Shelf LifeEasy to prepare-just add hot water liulstrongIngredients:strongPrecooked Noodles: Durum Semolina, Whole Eggs, and Salt. Noodles &am; Chicken Sauce: Cooked Chicken, Sweet Redpeppers, Modified Corn Starch, Chicken Fat, and Contains 2% or Less of: Chicken Base (chicken including natural chicken juices, maltodextrin, dried whey), Salt, Sugar, Hydrolyzed Vegetable Protein (hydrolyzed corn soy wheat gluten rotein, soybean oil), Flavoring (autolyzed yeast extract, safflower oil, naturla flavor), Onion powder, Dried Parsley, spices, and Turmeric (for color).Contains: Wheat, Eggs, Milk, SoyPacked in airtight #10 cans, Mountain House freeze-dried foods have the longest shelf life available. Mountain House can confidently claim a 25-year shelf life, because their testing has shown the shelf life exceeds 30 years! These independent university studies were performed on actual 20-, 25- and 30-year-old product stored under real-world conditions, which weren't always ideal -- not on newer product exposed to an accelerated-time environment in a laboratory.br The interior and exterior of the cans are coated with protective enamel for double protection. Their canning process, which is equal to military standards, uses both vacuum oxygen removal and nitrogen flushing. Your food isprotected until you are ready to enjoy it.br After opening, we recommend using the dry contents within one week for best results and taste, using the convenient resealable plastic lid between uses.br After hydration, treat any leftover hydrated food as you would fresh food.